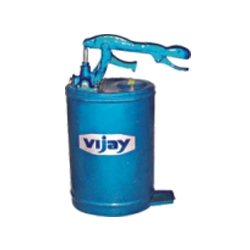 Providing you the best range of hand grease pump, pneumatic grease pump trolley mounted, automatic grease feeder and grease volume pump with effective & timely delivery. 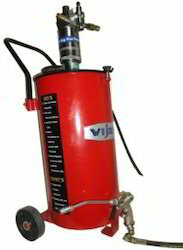 Our valued clients can avail from us Hand Grease Pump. These offered products are developed by making use of supreme quality required basic material while taking into consideration illustrated parameters of the industry. 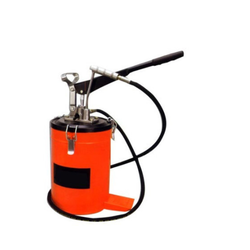 The offered products hold several attributes such as longer service life, resistance against corrosion and excellent performance, thus suitable for greasing operation at remote sites, where air power is not available. This is Automatic Grease Feeder with Metal alloy base & Poly carbonater dome. 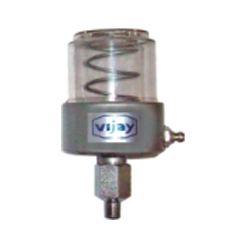 Grease Feeders have only 3 moving parts (spring, piston, ‘o’ ring) When grease is filled in the reservoir the compressed spring exerts balance pressure on the piston connected to the metering rod. Taper in the groove of metering rod causes change in discharges oriface area proportional to the decreasing spring pressure, thus a constant discharge pressure is maintained. We are widely appreciated for offering qualitative Grease Volume Pump. Engineered to perfection, these presented products satisfy defined parameters of the industry. These hand operated dispensing units are appropriate for self collapsible type soft grease only. Furthermore, in order to meet multifarious demands of the clients, we have made the offered products available in different specifications. Looking for Grease Pump ?